The General Data Protection Regulation (GDPR) is a European Union (EU) privacy law that becomes enforceable May 25, 2018. This law regulates how organizations treat or use the personal data of people located in the EU. Part of this law requires that EU citizens have the right to ask about how their personal data is stored and used. You should be prepared to answer these requests in a timely manner. With Mailchimp’s contact export tool you can quickly show any of your contacts how their personal data is stored in your account. 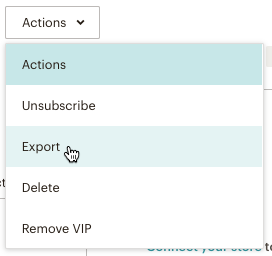 In this article, you’ll learn how to export a contact’s data in Mailchimp. Each contact export includes data attached to a specific audience. If a contact is in multiple audiences in your account, and wants to view all of their personal data, you’ll have to export their data from each audience individually. To export a contact, follow these steps. Click the contact’s email address to open the contact profile. Click the Actions drop-down menu and choose Export. When the export is ready, you’ll get an email with a link to the download page. You have to be logged in to Mailchimp to access it. You can also download the export directly from your account. Click the Manage Contacts drop-down, and choose Contact exports. Next to the contact’s email address, click Export As CSV to download the folder to your computer. Your export folder includes several CSV files. These files display all contact data stored in your account. All of these files are created for every contact export, even if there is no data to show. Learn how to open your export file. The campaigns folder includes files for abuses, bounces, clicks, opens, sends, unsubscribes, and mandrill. These files are created for every contact export, even if there is no data to show. Conversation tracking is a paid feature that lets you view your contacts' replies to your email campaigns from inside your Mailchimp account. The conversations export includes the time, subject, and email address of tracked conversations. Goal is a paid feature that is no longer available in Mailchimp. It tracked contact activity on your website so you could send targeted follow-up emails. The goals export includes the URL, browser, OS, IP address and title of any Goal tracking used with this contact. The ecommerce export shows all contact information related to e-commerce orders. This includes shipping and billing addresses, items ordered, price and tax informations, and any refunds or discounts applied. The list file displays audience fields and contact data that Mailchimp collects. The fields that appear in this export will vary based on the input fields on your signup form. Learn how to access the contact profile page to view information about a contact in your Mailchimp audience.